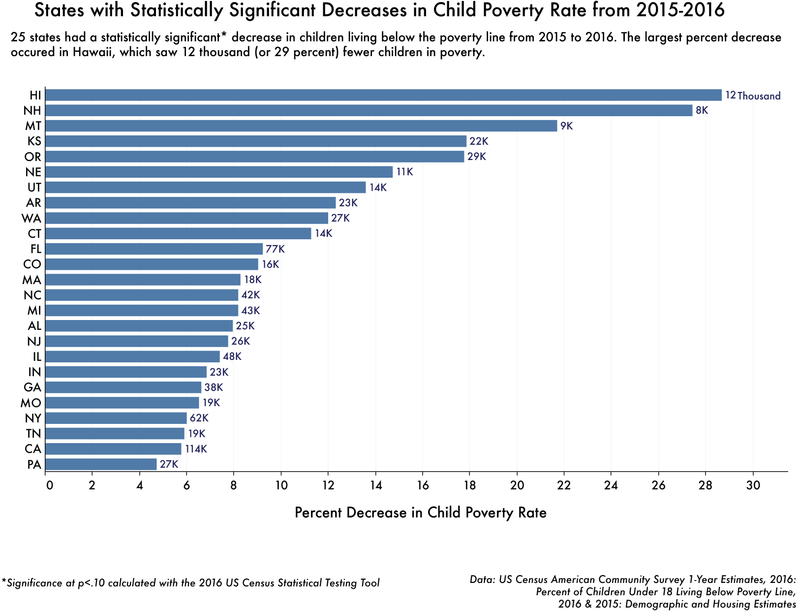 this chart showing states with a statistically significant decrease in their child poverty rate from 2015-2016. Ten states saw a statistically significant decrease of more than 10 percent in the percentage of children living in poverty from 2015-2016: Connecticut, Washington, Arkansas, Utah, Nebraska, Oregon, Kansas, Montana, New Hampshire, and Hawaii, which had the largest reduction of 28.9 percent. While the rate of child poverty increased in New Mexico, Oklahoma, Louisiana, North Dakota, the District of Columbia, and Vermont between 2015 and 2016, these changes were not statistically significant.